Dr Raymond Bird and Delwyn Holroyd. 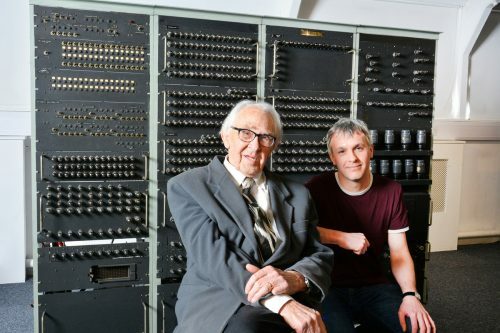 Photo by John Robertson for TNMOC. The HEC can be seen by Museum visitors in the First Generation Gallery at The National Museum of Computing on Bletchley Park whenever the Museum is fully open. 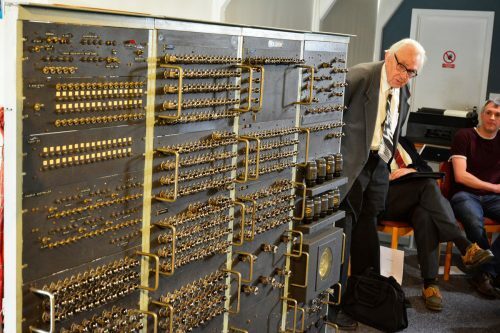 Dr Raymond Bird with the first version of the HEC at the First Generation Gallery at TNMOC, Bletchley Park. Photo by John Robertson. Precise quantity unknown, but HEC 4 is thought to have sold more than 100. The original HEC was not suitable for commerce because it did not have both a card punch and a printer – the HEC 4 had both and was therefore suitable for business.